I exchanged messages with Khalid but unfortunatly my weekend went from slow to crazy in one trip to IKEA, so I missed his availability. We should be able to arrange something during the week. The lesson, as always, is that you should never go to IKEA. 2 months ago I would have agreed with this 100%. But where else am I going to get a 4 x 4 Kallax for my Man Cave? Clearly you didn't like LEGOs when you were a kid. I'll think twice now before accepting your invitation to help you mounting IKEA furniture at your new home. But just twice. Once if there is any amount of beer involved. A 4 x 4 Kallax?! If only I had wall space (wife approval). Normally I would be over-ruled too, but we should be moving house in April and the new house have a nice little office building in the back garden and this will be my den/ gym/ games room. I really can't wait to have space to have all of my games together in one place for the first time as half of them are in the loft and the other half fill my wardrobe. I suppose I should explain myself! I just dislike IKEA quite a lot. In fact, my wife calls it a 'visceral hatred'. For our apartment in Portugal, we got some lighting stuff and an outdoor table from IKEA because it's kind of a necessary evil, but that's it. I just don't like the indoor furniture at all and I dread the actual shopping experience at IKEA which often makes me feel physically ill. I'm fortunate that at the moment I can afford to pay more for something I like than to cave into IKEA and pay less for something I dislike. Nope, so maybe that explains some of it. I feel your pain jungleboy. Genuinely I do. Before they built one in Reading, our nearest store was in Wembley which was still relatively close but could take hours either way depending on what the London traffic was going to be like. Plus I’d frequently have to sit on the roof or hang out of the window just to make sure we could fit everything into the car. On a typical visit, after two hours of trawling around all loads of fairly identical stuff I’d lose the will to live and wouldn’t be able to tell what I liked or didn’t like anymore. Becky would say “What do you think of these chairs?” and I’d say “They’re perfect; we should buy them” and Becky would say “That’s a cupboard” and I’d say “Let’s get one of those too then, quick, before they run out”. If you think Ikea's tough though, you should try it with kids in tow. I used to spend most of my visits trying to prevent them from playing hide and seek around the store or pretending to use the fake toilets in front of other customers. All while pretending to be interested in whether the book-ends “we’ve” chosen match the colour/ design/ pattern of the new cupboard doors or whatever. Now they’re old enough to go in the crèche I find it a lot less stressful, but still rather boring (unless I’m looking for things with funny names to post about on instagram). The one thing that it does have going for it is the restaurant. I love it! And Becky realised several years ago that she could get me to go to Ikea as often as she likes by promising that we’ll get lunch from the canteen there. Infinity billion meatballs + chips + gravy for the win! I feel your pain jungleboy. Genuinely I do. My wife and I go there just to eat sometimes. It is the only Swedish restaurant in town. I don't like the way the store is laid out. Why must I walk through the entire store just to see shelves? I do enjoy putting the furniture together though. 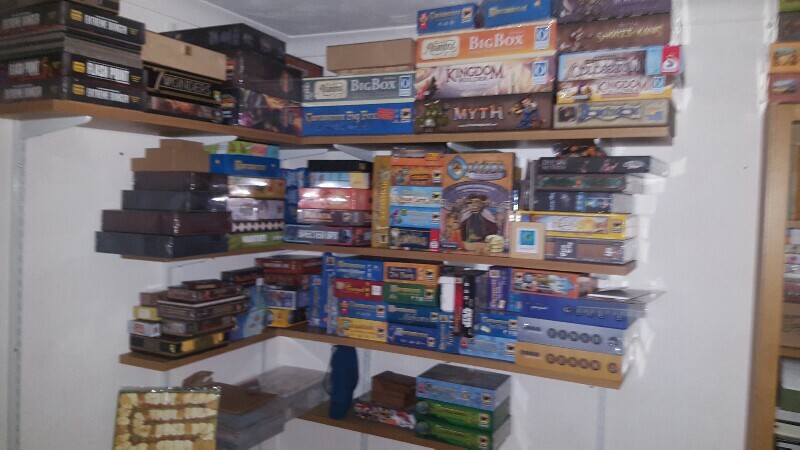 It is a shame that the bookshelves warp so badly under the weight of our games. Never go there, the closest's about 1000 km from my place. If you don't have birthdays, then I am waiting for you on my annual Carcassonne tournament! Hehe, good memory! So you caught me and my birthday is indeed later this month. But fortunately there's not enough time for danisthirty to find Carcassonne 2 Darmstadt Lego between now and then! But fortunately there's not enough time for danisthirty to find Carcassonne 2 Darmstadt Lego between now and then!